Hello and welcome to the latest webinar from Essent. Today we’re going to take an inside look at EssentOne, specifically in terms of managing customers and orders. We’ll mostly take a drop ship order from start to finish so you can see for yourself the power of processing it in EssentOne. Before we begin, a very brief overview of Essent. Essent is the leader in providing Comprehensive business management solutions since 1981 Essent has been serving Distributors, Decorators, and Suppliers in the promotional products industry since the year 2000 $3 Billion in Commerce flows through Essent’s solutions each year. We want to answer everyone’s questions in a way that’s sensitive to your time. So if you do have questions we ask that you please submit them in the webinar dashboard. And then we’ll be happy to answer those questions after the webinar. 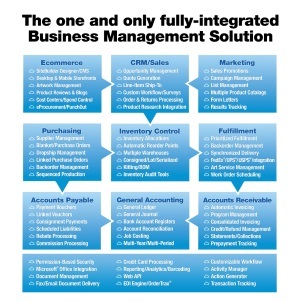 Slide 5: The One and Only Fully Integrated Business Management System designed for the unique needs of the Promotional Product Industry. EssentOne is a fully-integrated business management system. That means that from product research all the way out to accounting, information is going to flow automatically from one step to the next. That puts an end to re-keying data, and it means everyone is going to have the information they need to do what they do best. Today we’re going to look at the employee-facing portion of Essent – namely the EssentOne Business Management System But I also want to point out that in addition to your back office solutions, we also offer customer-facing solutions such as ecommerce websites and company stores. And we also offer vendor-facing solutions such as integration with your suppliers. And to take you through that is you presenter, Bryan Sheaffer. Bryan is the Vice President of Sales for Essent. He’s also a specialist in the promotional products industry. Bryan will tell you a little more about how EssentOne helps you manage customer and orders. Then he’ll take you inside EssentOne so you can see it for yourself. Thank you very much, Doug. What we’re going to show everyone here today on the webinar today is how EssentOne handles the critical parts of the sales process. For customer management, it’s going to do everything you expect from the CRM side. But the big advantage is it’s going to add the ability to create specific rules for specific customers. EssentOne is also going to track your Opportunities. For sales reps, that’s preparing for what’s coming next. For managers, that’s forecasting and budgeting. One of the major advantages of Quoting in EssentOne is that it’s easy to turn that quote into a Sales Order without manual data entry. With just a click, the Quote and all of its information is converted into a Sales Order. EssentOne also integrates with the most popular product research providers. So you can search those catalogs from right within EssentOne and pull in all that product data – again without manual data entry. Activities are all the jobs that go along with the transaction. So if it’s routine for you to follow up two days after a quote, for example, the system can remind you do that. Activities are Here are the rules we mentioned. Say you have have specific rules for specific customers -- like overrun/underrun rules, billing rules, or customer-specific pricing. That information is now going to automatically flow into the order when you select the customer. Put it all together and it’s a powerful way to manage orders. Opportunities and Activities are going to let you know what needs to be done when. And data is going to flow in automatically from CRM, Quoting, Product Research and Business Rules so that orders are ready to go right away. Slide 10: Let’s take a look. Customer Management in EssentOne has everything you expect from a CRM: Contacts, addresses, phone numbers, etc. But the difference maker is that EssentOne allows you to build in specific rules for specific customers. That could be pricing, billing, shipping, or other rules. The result is that the customer rules are automatically applied to the order. So you don’t have the situation where you’re manually adjusting every order based on the customer. All of the customer rules just flow in so you don’t need to manage the exceptions every time. Opportunities are the forward-looking portion of your sales process. You can look at your sales forecasts and future funnel. Sales reps are able to see what they need to prepare for. And management can see what’s coming up and budget for it. There are two powerful advantages of quoting in EssentOne. First of all EssentOne will standardize quoting. Rather than sending a PDF one time, and an email another time, or a fax another time, quoting is going to occur electronically through the system. The other big advantage is that quoting is integrated. There’s no need to start the Sales Order from scratch and re-key all the information. It’s easy to convert the Quote into a Sales Order with just a click. Product Research is also integrated within EssentOne. So the top product research catalogs are available right within the system. And all of that product information can be pulled right into the quote without re-keying. On top of that, since everything occurs inside the system all of your business rules are going to be applied automatically. Activities help move orders forward in a standard way. When it’s time to take a action on an order, the system alerts to appropriate staff. For Sales Reps, that could be sending a quote, sample, or another document at a given time. For operations and management, that could be follow ups like checking the price with the vendor or following up for artwork. Customer Rules are some of the most powerful features of EssentOne because all of the nuances and exceptions are going to be automatically applied to every order. For different customers, there could be different overrun and underrun rules. Different billing rules Different shipping rules. Or customer specific pricing. Instead of managing all of these variables on a case-by-case basis, EssentOne will automatically apply them so that orders are ready to move forward right away. And finally it all comes together in order management. The Prodcut Configuration process is one of the most complex parts of the transaction. But EssentOne simplifies it as a simple series of survey questions that automatically builds the order. Product research is integrated so there’s no more re-keying from the product research tool into the back office. Plus all the business rules are going to be applied, so there’s no more adjusting every order. And the information is going to flow from one step to the next so you’re not re-keying the data at every step. The information flows from product research to quoting to sales order all the way out to accounting. That concludes our look at CRM and Order Management in EssentOne for today. And with that, I’ll turn it back over to Doug who will tell you how to learn more. Thank you very much Bryan. The best way to learn more about EssentOne is to get your own one-on-one demonstration. Just visit essent.com/EssentOneDemo to schedule a free session for you and your company. You’ll be able to view and review the specific features that interest you the most. And we’ll be able to answer all the questions that you may have. Again, that’s Essentc.om/EssentOneDemo to schedule your own session to learn more. Thanks again to everyone for attending today’s webinar. EssentOne, a fresh yet completely familiar way to manage the critical parts of your business.